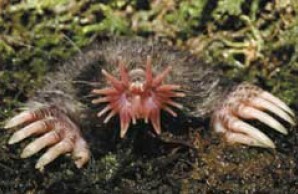 The star-nosed mole (Condylura cristata) is a small mole found in wet low areas of eastern Canada and the northeastern United States, with records extending along the Atlantic coast as far as extreme southeastern Georgia. It is the only member of the tribe Condylurini and the genus Condylura. The star-nosed mole is covered in thick, blackish-brown, water-repellent fur, and has large, scaled feet and a long, thick tail, which appears to function as a fat storage reserve for the spring breeding season. Adults are 15 to 20 cm (5.9 to 7.9 in) in length, weigh about 55 g (2 oz), and have 44 teeth. The mole’s most distinctive feature is a circle of 22 mobile, pink, fleshy tentacles called rays at the end of the snout, from which it derives its name. These are used to identify food by touch, such as worms, insects and crustaceans. The star-nosed mole lives in wet lowland areas and eats small invertebrates, aquatic insects, worms, mollusks, small amphibians and small fish It is a good swimmer and can forage along the bottoms of streams and ponds. Like other moles, this animal digs shallow surface tunnels for foraging; often, these tunnels exit underwater. It is active day and night and remains active in winter, when it has been observed tunneling through the snow and swimming in ice-covered streams. Little is known about the social behavior of the species, but it is suspected to be colonial.